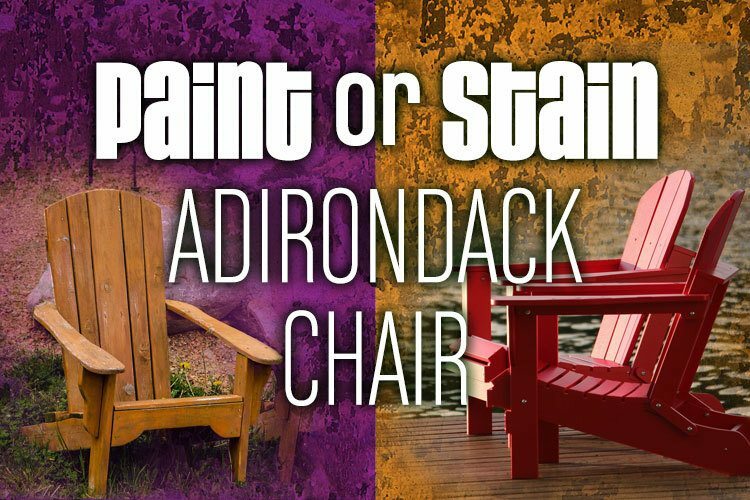 » Is it Better to Paint or Stain Adirondack Chairs? Wood Adirondack chairs are one of the best seating options you can choose for your outdoor living space. They are beautiful, durable, and with the proper treatment, they will last a lifetime. 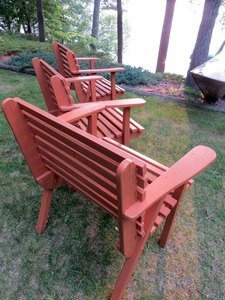 Part of the long-term care of wood Adirondack furniture is finishing it often to prevent water, sun, and pests from causing damage that can threaten the look and even the structure of your chair. When it came time for me to finish my chairs, I found that there is more than one way to finish the wood. So, I started to wonder; Is it better to paint or stain Adirondack chairs? There is no clear answer to which one is better, a lot of depends on your personal preference and the type of wood used in your chair. They both have their advantages and disadvantages, and some are reliant on your geographical location. To better understand if it is better to paint or stain Adirondack chairs you must first consider all the factors in your specific situation. I have put together a comparison along with a few other ideas to consider when thinking about finishing your chairs. What Are the Advantages and Disadvantages of Painting My Adirondack Chair? Painting protects the wood from damage from water, sun, and bugs. Painting lets you customize the color of your chairs to your liking as well as coordinate them with their surroundings. Paint colors are deeper and more vibrant for expanded décor options. Painting allows you to customize your chair with multiple colors and artful designs. Paint looks unnatural and doesn’t always fit into otherwise natural décor. Paint can chip and leave your furniture looking old and unattractive. New coats need application every season. Paint shows more dirt than stain. A little more labor intensive than staining. 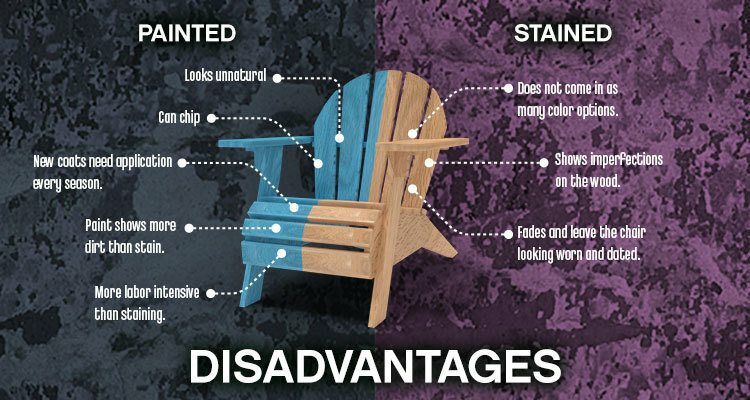 What Are the Advantages and Disadvantages of Staining My Adirondack Chair? Staining protects the wood from damage from water, sun, and bugs. It looks more natural than paint. The stain lasts longer than paint and doesn’t need reapplication as often. Stain does not come in as many color options as paint. Stain tends to show any imperfections in the wood. Stain can fade and leave the chair looking worn and dated if not refreshed. How Do I Paint My Chair? 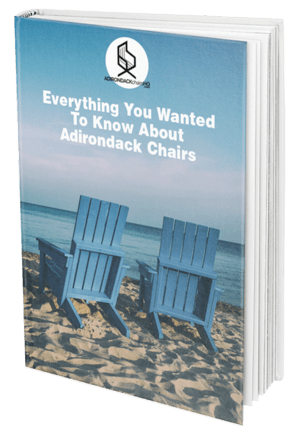 Once you decide that paint is the best option for your Adirondack chair, you are going to want to know the best way to paint it. Following these steps helps get the job done efficiently and increases the longevity of your paint job. If you are painting the chair for the first time, skip stepping four. Turn the chair upside down on a tarp. Wash any dirt off the chair and towel dry then allow it to finish air drying. Sand down rough edges and any remaining finish that is on the chair. Use a dry towel to brush away any dust from the chair. Add one coat of exterior paint and allow to dry completely. Sand the chair again with fine grit sandpaper, then apply another coat of paint. Once the second coat dries, flip the chair over and repeat the process on any unpainted surfaces. Coat the entire chair with a urethane sealant. Allow the sealant to dry for at least 24 hours before using your chair. How Do I Stain My Chair? Staining a chair is similar to painting, but with enough differences to have separate instructions. Oil based stain is always the best choice when staining outdoor furniture. Sand the chair down removing any rough spots. Wipe down the chair with a dry towel to remove dust. Coat the chair in wood conditioner and allow it to dry for 20 minutes. When brushing on the stain make sure that you are brushing with the wood grain. Allow the stain to dry completely before flipping the chair and staining any uncovered areas. Once the stain dries, cover the chair in a stain sealant and let it dry completely before using your chair. Do I Have to Paint or Stain My Chair? The short answer is yes, with a few exceptions. Finishing your chair is important for several reasons, but all are important for the stability and longevity of your chair. Finishing your chair protects it from looking dull and weathered. It also helps protect from outside forces like bugs or water that can cause instability and make your chair breakdown far before its time. There is one situation where you don’t have to finish your chair. If you are willing to pay a little more, you can buy hardwood chairs that you don’t have to finish. Hardwoods like Teak and Shorea emit their oils even after they have been cut and shaped which naturally protect the wood the same way that finishing it would. This route isn’t immune from disadvantages though. If you choose hardwood, you need to consider that it will only come in the color of the wood. Also, the natural oils protect from outside factors that will affect the structure of the chair, but it does not protect from natural fading that happens from sunlight. Are There Other Ways to Protect My Chair? There is no substitute for finishing your chair with paint or stain, but there are a few more steps you can take to add extra protection to your chairs. It’s pretty rudimentary, but cushions do a lot to protect your chair. By covering major areas of the chair, cushions take the brunt of dirt, water, and sun that hit your chair each season. The nice part is that they are machine washable so you can just toss them in the washer and dryer then put them right back out there to keep protecting your seat. If you ever do feel the need to replace your cushions, you will most likely only need to replace the cushion cover which is much less expensive than replacing an entire chair. For some reason, people scoff at the idea of covering their furniture in the offseason, but one of the smartest things you can do is buy covers for your outdoor furniture. Covering your furniture over the winter protects it from sitting under piles of wet, cold snow all season. Covers come in handy just as much during the season. Putting covers on your furniture before a big storm protects them from pounding rain and high winds that can damage the finish or the structure of the furniture in some extreme situations. Though a good portion of protecting outdoor furniture is about keeping water off of it, it doesn’t hurt to get your furniture a little wet every once in a while. Cleaning your furniture regularly with soap and water or a pressure washer keeps problem causing dirt and grime out of all the crevices in your chair. It’s best to do it on a sunny day, so the chairs dry quickly. How Do I Protect My Outdoor Cushions? Cushions add comfort and protection to your chair, but if they don’t have the protection of their own, you are going to spend a lot of money replacing them. Clean them up – If your cushions aren’t new, the best thing you can do is clean them. Remove the cover from the cushion and run it through the washer and dryer while allowing the inside of the cushion to air dry inside. Put the cushion back together and treat it with a water and stain fighting fabric protector. Make sure your cushions anchored tightly to the chair, so they don’t come off and need cleaning again. Bring the cushions in and store them in a dry place during the offseason for the best results. Are Oil-Based or Water-Based Stains Better? I thought there was a clear winner between the two, but specific needs may swing your preference one way or the other. Water-based stains dry quickly and have a fainter odor which allows for quick finishing jobs that no one will notice. Water-based stains also keep their color longer, though they don’t always dry as evenly. Most importantly, water-based stains are not flammable making them perfect for wood furniture that spends a lot of time around the fire. On the other hand, oil-based stains take longer to dry, but that means that they have a more even finish. 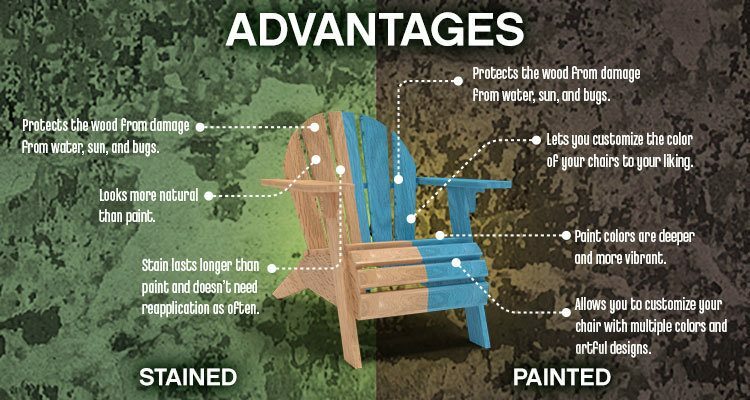 Oil-based products protect better from the elements and in doing so, last longer than water-based stains, so your chair does not need refinishing as often. When Should I Replace My Chair? Adirondack chairs are sturdy and when well-maintained they can last generations, but everything has an expiration date. To know if it is time for you to replace your chair you should ask yourself a few important questions. Is it repairable? A lot of times wood furniture can be repaired instead of replaced. If you can replace a part instead of the whole piece, it will save you a lot of money, though it will take a little more work on your part. Will a repair cost more than a new chair? If repairing your chair is going to cost almost as much as repairing the chair you should save your time and get a chair with all new parts because if one part needs repair, there are probably more following shortly. Is it Dangerous? It is always better to buy your outdoor furniture offseason, but safety should always come before money. If it is a purely aesthetic thing, wait until winter to buy, but if the damage will affect the stability of the chair, it is better to replace the chair now. 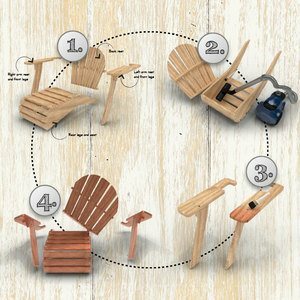 We have detailed infographics on How to Stain your Adirondack Chair and Types of paint for your furniture.